When a region such as Western Australia’s Coral Coast has warm sunny days throughout the year, that can only mean there’s loads of sun loving fun to be had. Then, add into the mix some magnificent beaches, rugged coastlines, breathtaking gorges, 4×4 tracks, and some of the best natural attractions in the state, and this place can only be described as an adventurers’ paradise. So with a holiday destination as good as this, how do you fit in all in within a couple of weeks? Well, the short answer is, you can’t. For this trip, we decided to keep to the coast, spending as much time doing water based activities, and ticking off some bucket-list items along the way. Starting our adventure at the Coral Coast’s southern end, we pulled into the quaint fishing village of Cervantes, which is less than two hours’ drive north of Perth. Don’t let its small size fool you, as the beautiful beaches and other surrounding natural attractions makes it the perfect place to base yourself. One well known attraction we visited not far from Cervantes is the spectacular Pinnacles Desert located in the Nambung National Park. 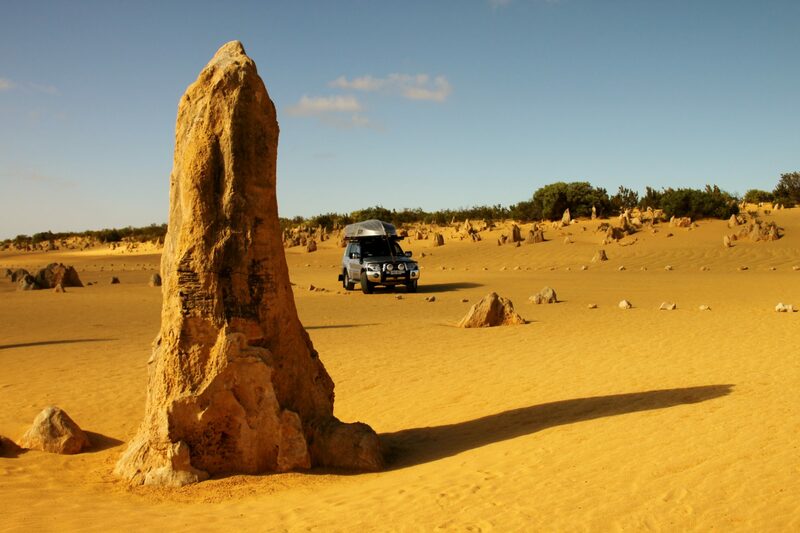 Here, the numerous striking naturally made limestone spires are dotted around 190 hectares of the park, and the 4km circuit provides an opportunity to walk or drive through the spires, of which many dwarfed our 4×4 in size. The light does wonders early morning or late in the day, so if you can plan to visit then, you’re in for some sensational landscape photography. Travelling further up the coast, you’ll find the beautiful beaches give way to a wild and rugged coastline with 100m cliffs that drop into the Indian Ocean. Needless to say, this coastline has a dark shipwreck history, so swing by the Geraldton museum to learn about the maritime history which is showcased here. The museum provides a fantastic insight into wrecks like the Batavia which dates back to 1629, where we quickly learnt just how unforgiving the coastline can be. While you’re at the museum, make sure you allow time to watch the films on the Kormoran and HMAS Sydney – they might only be short films, but they’re very educational. There is no doubt a highlight of the Coral Coast region is its huge diversity, especially when you can be chilling out at the beaches by the Indian Ocean one minute, and hiking through one of the national parks close by the next. Kalbarri’s National Park is a classic example, with its Murchison River creating a breathtaking gorge that can be seen from various lookouts within the park. Natures Window is a major attraction within the gorge, with photos taken here adorning pretty well every visitor’s photo album. By now, you’re probably worn out from all that bushwalking, so head back to town and join a sunset Murchison River cruise for a completely different perspective of the gorge. If you’re like us and travelling from the eastern states, you will appreciate the sensational Western Australian sunsets here, especially when you’re able to see the sun dip into the Indian Ocean all along the coastline. We’d been looking forward to our next stop to Denham for ages, as we aimed to spend a few days looking around the area. 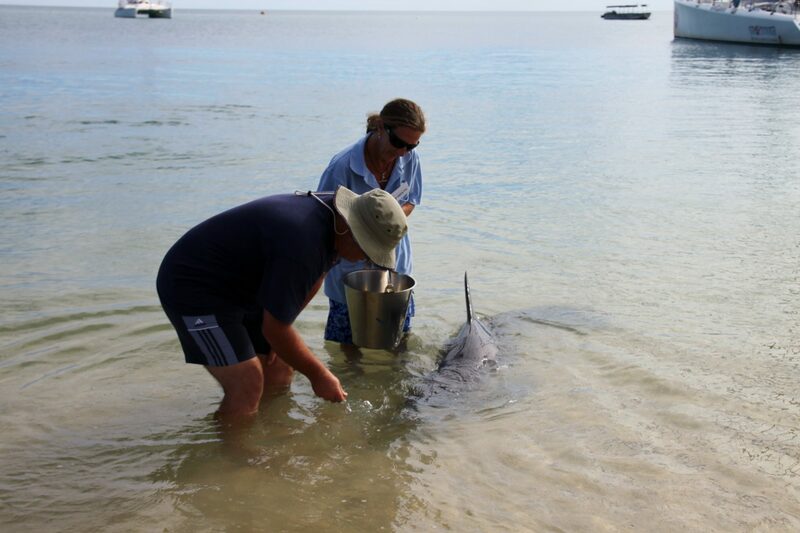 Having first visited here more than 20 years ago, the thrill of being close to dolphins again at nearby Monkey Mia was still as exciting for me now as it was back then. Allow plenty of time to park and make your way to the beach, as the opportunity to feed the dolphins is a very popular attraction. Whether you’re one of the lucky ones to be volunteered to hand feed them, or even just an onlooker, it’s a fantastic experience for all. 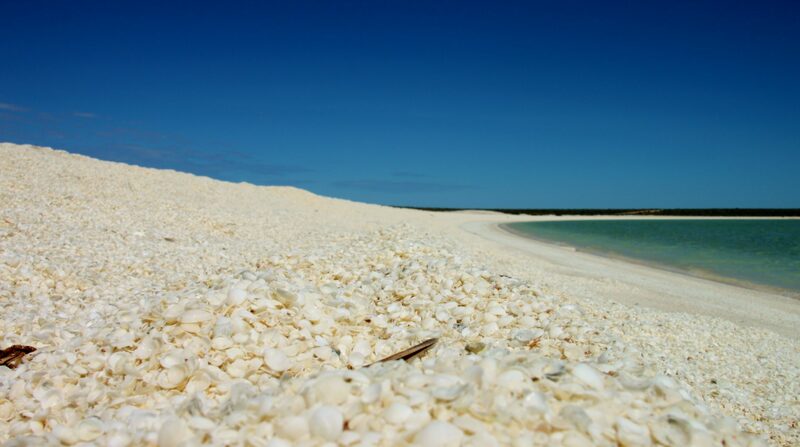 Shell Beach is located less than an hour from Denham, and if the stunningly beautiful turquoise waters of the area aren’t enough to excite you, the stark contrast of a beach full of snow white coloured cockle shells will. With seawater salinity levels here exceeding those of regular beaches, this area has been the perfect environment for cockles to flourish. But it’s not just cockles that like this environment, when a little further around the bay at Hamelin Pool, lies the world’s oldest and largest living fossils called stromatolites. In a nutshell, living marine microbes have slowly built the stromatolites which are up to a metre in height, and can be easily seen from the boardwalk provided. Further up the coast, we had a very special date in Coral Bay, as we had planned to tick off a long-standing bucket list item – swimming with manta rays. Naturally, it can be a little disconcerting swimming in water where anything that’s normally bigger than you will eat you, but our tour with Coral Bay Eco Tours was simply amazing. Some of the larger rays (don’t worry, they have no stinging barbs) had around a 4m wing span as they swum underneath you doing “loop the loops”; all while feeding and filtering the plankton with their one metre wide mouth open. Talk about excitement plus! They seemed to be quite relaxed with our presence, and after a full day of snorkelling, to say we slept well that night was an understatement. Our Coral Coast adventure was far from over, as we were still to visit the town of Exmouth and the nearby Cape Range National Park. Having an affinity for Australian lighthouses, our first stop was a visit to Vlaming Head Lighthouse which overlooks Lighthouse Bay. Dating back to 1912, the lighthouse might no longer be in use, but the views from here and the structure itself are sensational. If you haven’t worked it out by now, we’re just a couple of adventurers at heart. So there was another reason we were visiting Exmouth. Yep, it was time to tick off another bucket list item. 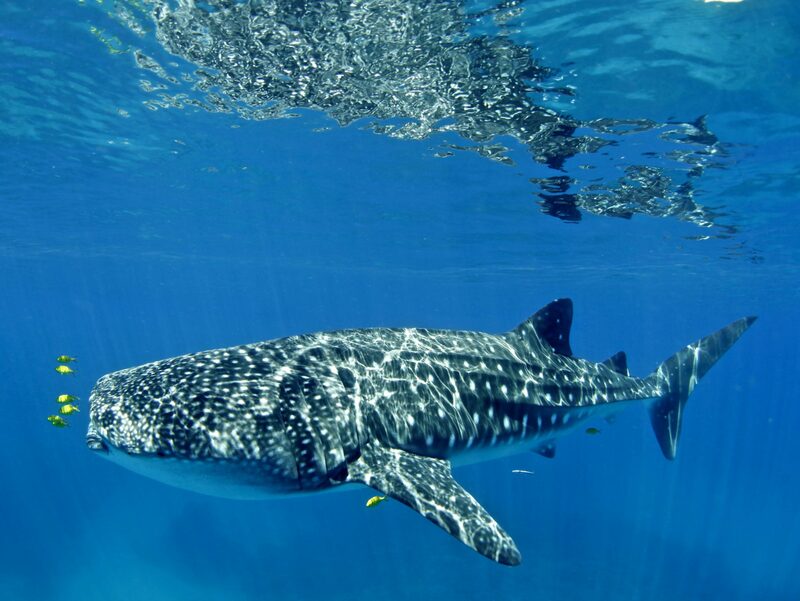 If you’re visiting during March – September as we did, take one of the fantastic day tours and swim with the largest fish in the sea – the whale shark. I can assure you nothing really prepares you for how big they are until you’ve jumped into the water at which point the adrenaline well and truly kicks in. Somehow you find yourself swimming like you’ve entered the Olympics 50m freestyle race, and madly trying to keep up with these graceful creatures. I’d be lying if I said it was easy to keep up once they passed you, but what a buzz! This was a fun-filled, adrenalin pumping tour with long-time tour operator, Three Islands Whale Shark Dive, which had us swimming with four whale sharks during the day. This was a massive item ticked off our bucket list, and one activity that I will never forget. To split our trip between caravan park stays and camping, we headed into the national park for a few days. While there’s a number of campgrounds available, we chose the Lakeside campground for our visit – its location right next to the beach was a huge drawcard, and the reef close to the shore making it perfect for snorkelling. Before losing ourselves with water-based activities, we swung by the Milyering Visitor Centre to first learn more about the national park and its attractions. At the southern end of the park, we found the one hour cruise at Yardie Creek Gorge with its high gorge walls to be informative, and it provided an opportunity see the rare black-footed wallaby feeding along the gorge walls. Back at camp, we learnt strong water currents prevailed, which is something to consider if you’re travelling with children. We used the current to our advantage, by walking one kilometre up the beach before entering the water to reach the reef, which was surprisingly close to shore. This place must be the west’s answer to the Great Barrier Reef! With little effort, we allowed the current to float us back towards our camp to conserve our energy, allowing us to observe loads of fish, stingrays and magnificent corals as we floated by. By the time we returned to the campground early afternoon, there was a strange hive of activity as the other campers were packing up. It didn’t take us long to realise that the lake opposite the campground was overflowing and beginning to fill the campground, with the water coming perilously close to our caravan. With the ranger visiting shortly thereafter and explaining a king tide was scheduled for the following day, they closed the campground and said we needed to vacate, which under normal circumstances would be annoying, but not today. This time of year is perfect to get out and explore the Coral Coast, and whether you’re into nature, bushwalking, fishing, food, or history – you’ll find it hard to run out of things to do and see. And if you’ve jam packed your stay with so many activities that you feel wrecked (like us), you might just need to head home for that holiday! Western Australia’s Coral Coast starts 200 kilometres north of Perth at the town of Cervantes, and extends 1,100 kilometres north to Exmouth. The region experiences a warm climate all year round – we experienced days in up the upper 30s around Coral Bay and Exmouth during March, while other months are cooler. Popular times to visit are March through to October, so if you’re planning a wildlife tour of sorts, it’s best to do your research and book beforehand to avoid any disappointment. A range of accommodation options are available – including caravan parks which can fill up quickly during peak times, so book ahead. Station stays are also popular, as are the numerous national park campgrounds. 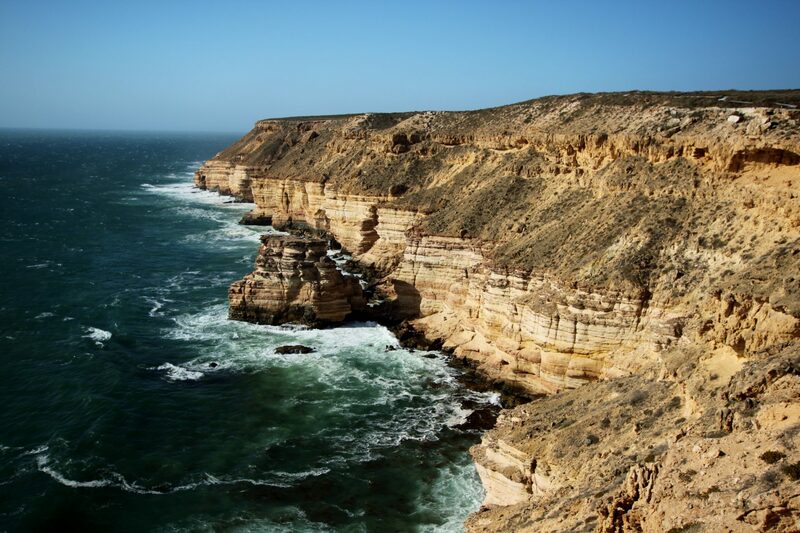 Sandy Cape (4×4 required), Stockyard Gully National Park (4×4 required), Kayak in the Francois Peron National Park, Sand board at Dongara, enjoy the 360 views from Shothole Canyon, a day tour of Dirk Hartog Island, check out the blowholes and Quobba coastline near Carnarvon. Visiting the National Parks along the Coral Coast means you’ll need a park pass. Day passes for each park costs $12 per vehicle, which can quickly add up. However, if you’re planning to visit a number of parks, purchasing a Holiday Park Pass for $44 per vehicle is way more cost effective. This pass enables you to visit as many parks as you wish for any four-week period. The passes are available from the Department of Parks and Wildlife Offices and the major tourist information centres within the region.